Heading into Milwaukee Juan Pablo Montoya had a 54 point lead in the championship. After the race that lead still held strong at 42 points. If the championship had ended after that race, Montoya would have won the championship by the fifth largest margin in the last twenty years. Rahal had other plans. With his win in Mid-Ohio and the championship leader’s eleventh place finish, Rahal closed the championship down to just nine points with two races remaining; the nine point gap would be the sixth closest championship finish. 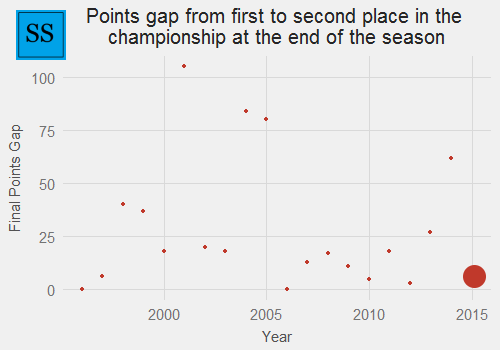 As a side note, the only way this year’s championship could be the closest ever is if it ends in a tie. This has happened twice before, in 1996 and 2006. Montoya has two races, including one double points race in Sonoma, to try and get back to the level of success he has enjoyed throughout the season. Even though Pocono has only been contested for the past two years, we can still take a look at results there and at Sonoma to see which driver has the upper hand heading into the final races. It’s important to note that Scott Dixon and Helio Castroneves are both very much in the championship fight, but Rahal is obviously the main competitor to Montoya. Looking at the past year’s data, Montoya certainly has the upper hand at the two tracks. He won at Pocono and placed top five at Sonoma, while Rahal barely managed to keep it in the top twenty. Montoya has also done better at 500 mile races in general, winning last year at Pocono and this year’s Indianapolis 500. He also finished fourth in Fontana – but Rahal won that race. It is a small sample size but it trends positively for the current points leader. Rahal brought the championship fight back into play at Mid-Ohio and set the series up for a close finish this year – on track to be one of the tightest ever.